A Bose wireless Bluetooth portable speaker system. 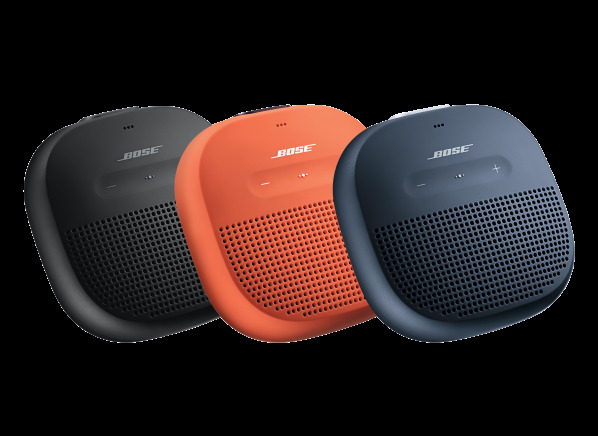 A Bluetooth wireless portable speaker system from Bose. Stereo analog audio input Stereo analog audio input Has a jack for a two-channel analog audio input connection from another device such as a MP3 player, TV, cable box, or satalite receiver. Optical digital audio input Optical digital audio input Has a jack for an optical digital audio input connection from another device such as a TV, cable box, or satalite receiver. Headphone jack Headphone jack Headphone jacks let you listen to audio output through standard stereo headphones. Active subwoofer pre-amp out Active subwoofer pre-amp out Has an output connection for a subwoofer with a built-in amplifier. WiFi content sharing technology WiFi content sharing technology The communication systems used to transfer (stream) data via a WiFi network. The Apple AirPlay streaming system can stream audio to one AirPlay compatible device from a mobile device running AirPlay (i.e. iPhone, iPod Touch, or iPad) and up to six different AirPlay compatible devices from a computer running iTunes. The Sonos system can stream audio from Internet radio or the audio files from the home network computer to Sonos speaker systems and other Sonos components in up to 32 separate rooms. The maximum number of DLNA (Digital Living Network Alliance) compatible devices that can send/receive audio streams is not specified - it depends on the WiFi network bandwidth. Remote Remote Comes with a remote control, or an optional remote control and/or an optional remote control app is available for the system that can be downloaded to a smartphone or tablet. Power source Power source The unit can be operated on AC, batteries, or either as specified. Adjustable tone settings Adjustable tone settings Indicates if system has bass and treble controls, selectable pre-set tone settings, or a graphic equalizer controls that can be used to adjust the speaker's tonal balance to improve tonal accuracy and/or suit personal preference. Sleep timer Sleep timer Can be set to shut off at a predetermined time or after a predetermined time period. Wake timer Wake timer Can be set to turn on at a predetermined time or after a predetermined time period. Speaker phone w/built-in mic Speaker phone w/built-in mic Can be used as speakerphone speaker when paired via Bluetooth to a cellphone. Updatable software/firmware Updatable software/firmware Firmware or software can be update to incorporate new features that become available for the system. Warranty (mos. ): parts/labor Warranty (mos. ): parts/labor Indicates the length of the manufacturer's warranty for parts and labor, in months. Other features Other features Other features that may be included are listed here. USB charging cable, quick start and warranty. Claimed battery life Claimed battery life The manufacturers claimed battery life of this product in hours.